Can the Guardian maps be improved? I’ve been looking at the maps created by The Guardian (UK Newspaper) with interest. They’re usually created using Google Fusion Tables to hold the data and display the content as a thematic map on top of a Google Map. Take for example this recent map they created for the WHO Millennium Development Goals 4 and 5 progress check. It’s an important map to publish and shows that in 1990 (MDG4) the highest infant mortality rates were in Central Africa, a sobering thought. Click the image to go to the Guardian site and view the interactive version of the map. To highlight trends in data through a map relies on effective cartography. I think from a cartographic point of view the map is not so great with a strange choice of colours. A single colour intensity range would better show the user where the highest and lowest areas are (and could be printed out in greyscale and still make sense). I’m not sure that blue and red work as the opposite ends of a scale in the map. Blue = cold and Red = hot?! So, I thought I’d have a go at improving the map myself (something which you can do as The Guardian give access to the underlying Google Fusion Table). 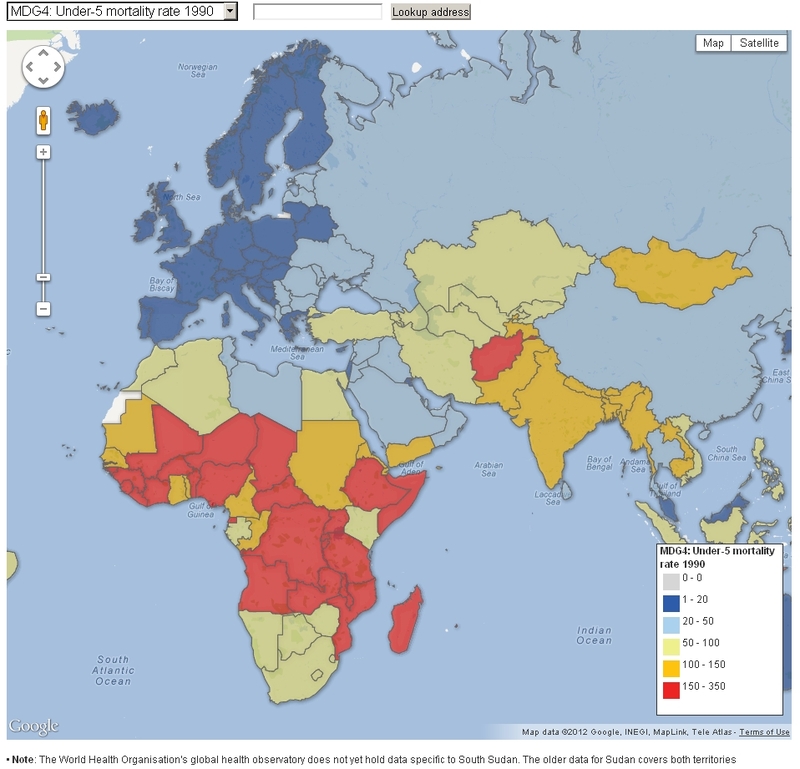 I went with a purple colour intensity (light purple = lowest infant mortality to dark purple = highest infant mortality. Does it work? You can immediately spot that there is no data available for Afghanistan (highlighted in red). On all of this, cartography and the way a map looks is very subjective. Perhaps you like the top map better? To help us reach informed decisions on the styling of maps etc. help is out there! There are some great cartographic courses out there, which describe the best use of colouring and styling for mapping. In fact the AGI and BCartoS are running 2 such courses on “Better Mapping” on the 19th June in Leeds and 26th July in London. Happy Mapping! I’ve now embedded a Lanyrd guide to geospatial events on this website. See the When tab above or click here. The events are taken from the Lanyrd guide “Geospatial Loveliness” compiled by @RolloHome and others. Please feel free to add more geospatial events to the list here. Looking forward to seeing you at a future geo-event!